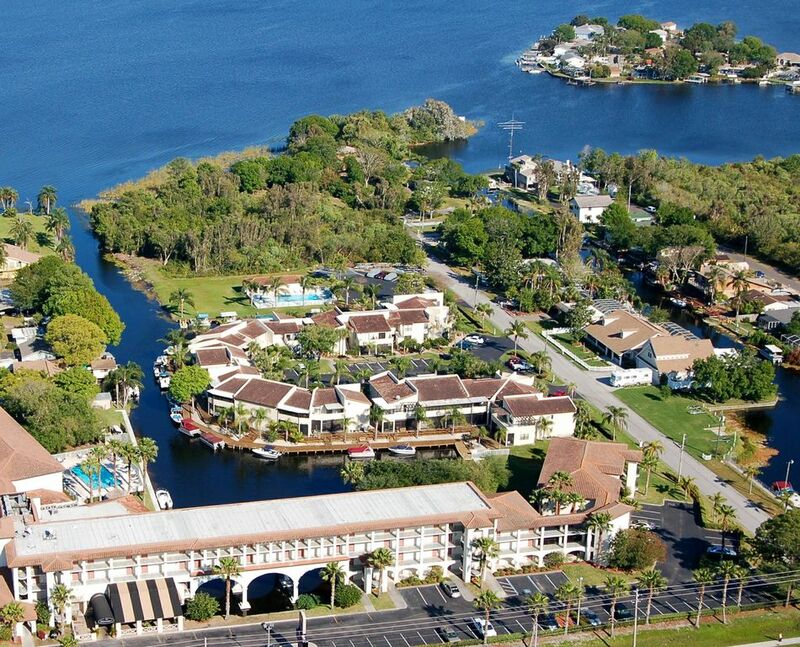 This is beautiful 'Lake Tarpon Villas' condominiums. This fully-furnished condo is located on Lake Tarpon ten minutes east of some of the most popular Gulf beaches and sunsets in the world. We are also just minutes from the Clearwater Marine Aquaruim where you can meet 'Winter the Dolphin' our world famous star from the movie 'Dolphin Tale'. This lovely complex is surrounded by water and boardwalks, a notable feature for peace and tranquillity. This second floor condominium comes with an assigned parking space near your front door with guest parking in the rear. The condo's rear Patio overlooks the pool area, private boat dock, and your own 19 foot pontoon boat for your use. There is a large heated pool and a six-person jacuzzi. You will also find a laundry center with washers & dryers for your use near the pool area. Do all your at one time and take a relaxing dip in the pool while you wait. There is an additional patio off the master bedroom which has a spiral staircase leading up to a private sundeck for sunbathing. There is a king bed in the master bedroom and a queen bed in the guest bedroom for additional family or guests. The family room sofa has a queen size hide-a-bed to sleep two in comfort as well. The unit is ideal for four adults and two children. Lake Tarpon is approximately four miles long and two miles wide and is well known for on of the best bass fishing lakes in the state. The lake is perfect for bass fishing and water skiing. This condominium is one of 40 units and is secluded from the busy Gulf beaches yet close to shopping malls, restaurants, and Disney Resorts. The Pinellas Suncoast has something for everyone, young or old..Everything under the sun to enjoy. Take your own pontoon boat out fishing, dinning or just cruising! Your minutes from several popular beaches if you like sun bathing and swiming in the Gulf of Mexico. Pick sunshine in freshwater or saltwater... It is here for you and your family to enjoy..
Great Condo. Awesome family vacation. Paul was great to work with and was very helpful with the boat. We had a great week in the area and the lake was an added bonus. Property and activities were just as advertised and completely met our expectations. Paul and Karen have a wonderful place for family fun on the lake. It was an added bonus to have the boat available for fishing and exploring the waters of Lake Tarpon. Condo was clean and well stocked with everything needed except food. We would definitely recommend staying here and would in the future. Thanks for the kind words about our lake tarpon condo. Karen and I pride ourselves in making our guests feel comfortable and secure. All the amenities are there, just like home! Please come back and visit us again! Paul and Karen were awesome hosts. Their home was super clean and inviting with all the little things included. Coffee in the morning out on the porch overlooking the water was so relaxing. My niece and nephews loved the day out on the float boat. Have family in the area so we will definitely be back! This is our fifth time staying in this wonderful condo and it feels like our second home. It is VERY well stocked with everything you need for your stay. FULLY equipped kitchen, a closet with coolers, pool toys, etc. Plenty of linens, etc. Even multiple hairdryers, and a flat iron in the bathrooms. Oh, and did I mention THE BOAT? Its wonderful to have access to it all day, anytime you feel like it. The pictures of the property are very realistic. This smaller complex is also very quite at night. Just book it! You won't regret it! We stayed for a week in Paul and Karen's place, and couldn't have been more pleased. The condo had everything we needed, and more! There were ample towels, linens, and even beach/fishing stuff to be found in the front closet. We had already bought toiletries, but found that there were small amounts left in the condo that we could have made use of. The decor is as seen in the pictures. We did take advantage of using the pontoon, and found a cruise around the lake very relaxing in the afternoons. The pool, although small, was the highlight for the kids. We were able to get to the beaches in 15-20 minutes drive (although putting Clearwater into the GPS resulted in a 45+ minute trek....not Paul and Karen's fault). The condo is quiet and cozy. We were able to spread out fairly well (Family of 5; kids aged 13,8,10). It is close to several restaurants, both chain and local, and also close to a theater. We will definitely look to stay here again if we venture back to this area. Thank you for a very nice conclusion to our trip to Florida! We had a great stay here. The condo was clean and comfortable. The boat was great and right off the lake. Paul a great guy and a ail able if you need him. I would recommend a stay here if your looking to spend some time on the water and enjoy the boat! Dinner Cruises and Helicopter rides available upon request. Please send requests. NOTE: Winter Season - monthly rental only unless nights show available Weekly Rentals in November - December. LAPTOP USERS! Free High Speed WiFi Internet Service and long distance calling available. BOAT USAGE: determined after a boat orientation and check-ride. CANCELLATIONS: FORCE MAJEURE: Force Majeure is defined as any cause attributed to acts of GOD, accidents, natural disaster, weather or other occurrences beyond the reasonable control of the LANDLORD, and not caused by the LANDLORDS’S negligence. No warranty is made as the suitability of weather with respect to this lease. (a) If the Property becomes unavailable to the TENANT prior to occupancy, for any reason, LANDLORD agrees to refund the full amount paid to the date of cancellation, and TENANT agrees to release any claims against LANDLORD. (b) If, for any reason, the TENANT cancels this Agreement before 60 days from the Arrival Date, TENANT will receive a full refund of all amounts paid, less a $50.00 cancellation fee. For TENANT cancellations made 45 up to 60 days, their deposit is forfeited. The TENANT who cancels 45 days or less, all funds are forfeited unless LANDLORD can re-lease the property under the same terms and conditions of this Agreement. The LANDLORD will always attempt to Re-Lease the property for the TENANT that cancels, in order to save all funds forfeited. The Date Change Provision, working between the TENANT and LANDLORD to find and reserve an alternate date/s, the change must be made within the same year of the of the original date of Lease, and if the LANDLORD is able to make the changes. (c) There are no cancellations permitted within 14 days of TENANT Arrival Date. All amounts paid (Reservation Deposit and Final Payment) will be forfeited.